Only time will tell whether circles become a killer feature that gives Google+ an edge over rivals. I wrote a bit about the privacy angle of circles on the Open Digital Policy Blog. It will take a bit of time for users to thoroughly understand the functionality - and any unintended side effects - of the new features of Google+. Already, my partner in Open Digital Julian Ranger has uncovered a potential for spam. But my general impression is that rivals should be very worried indeed. Until yesterday there was no serious rival to Facebook. If you wanted to share a few photos and have a chinwag with friends you had Facebook or a slew of buggy functionality-void rivals. A challenger doesn't necessarily have to beat Facebook, it just has to offer a credible alternative. There's enough reasons to leave Facebook, but I'll get on to that in a minute. Part of the credibility challenge is providing impetus: a critical mass of initial users so enough people can try out the features; and Google is one of the few companies in a position to do that, literally overnight. 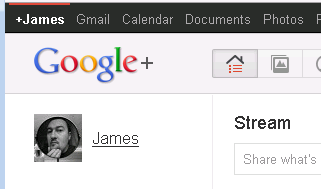 Google has keyed Google+ into its mainstay - the search page. I noticed a new top menu on Google.com a few days ago, and this is why. Google+ notifications etc will be tied to the one page most of us use with equivalent frequency to our favourite social network. Clever. I mentioned reasons to leave Facebook. In addition to the obvious well-reported issues (privacy, privacy and an over-bearing obsession with identity and control) there's the baggage. A new social network gives us a fresh start. No people we haven't spoken to since that fateful fumble, plus a chance to sort and group the people we choose to add into circles. All of a sudden the valuations for one-product companies Facebook and LinkedIN are looking incredibly optimistic. 1. I've been on google.com and can't find Google+. I'm guessing this is because I don't have an invite - AHEM! 2. This all sounds a lot like the social integration Yahoo have shoe-horned into all their stuff. But more people use Google, of course. 3. It still doesn't sound as much fun as Facebook. I'm still refusing to be scared of Facebook. 4. I've said it before and I'll say it again - Google is head, shoulders and most of the torso above all other tech companies. 5. I made a point of not snogging any goats 23 years ago - makes life a lot simpler. IMHO it all comes down to adoption. Of the 277 people I am connected to on Facebook only 11 of them have Google accounts! There are a couple of others that like me have an the same email address for most of their life and now get "another" gmail address to use google products (you don't have to but Google STRONGLY suggest you have a free gmail address). This has lead to a number of people having more than one email address, their normal one and a gmail one. Horribly messy and I think the killer for this and other Google services. Fair points, guys. The email thing Dan mentions bugs me, this blog's email goes through Google Apps, yet I have to use a gmail address to get "profiles" to get G+. Pah! Hattie - I sent you an invite.